Reginald (Reg) Thomas Jarman was born in Coraki, New South Wales on 18th September 1920. He was educated at the local public school and worked on the family dairy farm. Around this time he joined the 15th Light Horse Regiment, a militia unit. On 13th June 1941 he enlisted in the Australian Imperial Forces in the 2/10 Field Ambulance. His regimental number was NX33194. 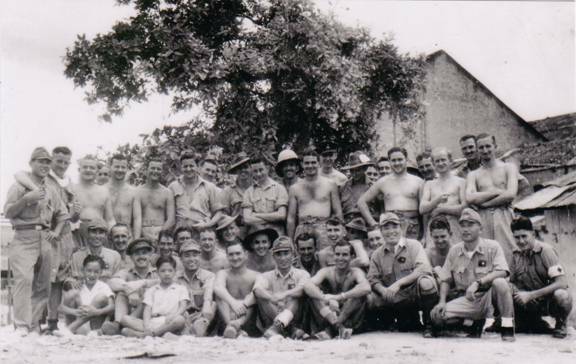 The Unit moved to Malaya/Singapore in August 1941. He became a Prisoner of War in February 1942. In approximately April 1942, working parties were called for and numerous groups left Changi. One such party of some hundreds of POWs were sent to an ex-amusement park called The Great World – this had a wall all around. They were then divided into groups of about thirty to work in different locations throughout the city and the waterfront. From memory, about twelve 2/10 Field Ambulance personnel, under Captain Pete Hendry, were there to cover all the working groups plus run a ‘hospital’. Reg (from 2/10 Field Ambulance) was allotted as a medical orderly (zambuk) to the above 2/18 Battalion working party, known as the ‘Canteen Party’. These are my personal recollections of the time I and others spent imprisoned and in the custody of the Japanese as a prisoner of war. I appreciate that others may recall events and people differently, yet, this is an account from my perspective. What has impacted me most powerfully in recalling the detail of the time period covered has been man’s incredible inhumanity to his fellow man - as imprisoned former combatants on the one hand, and yet, also the instances of respect and even camaraderie shown by one of our captors to us hapless fellows – as you will read. Paradoxically, it was one of my enemy captors – Masuta – and his treatment of myself and others, who enabled me then, and in the ensuing years, to be able to forgive – as you will see. One of the teachings of Christ*** is to ‘Give to Caesar that which is Caesar’s, and give to God, that which is God’s. When Masuta was conscripted into the Nippon Army, he gave to Tojo his loyal service with distinction, and he gave to God that which belonged to God. I am forever grateful for Masuta’s Christian witness in such difficult times. His never-wavering faith in Christ enables me to forgive those who perpetrated such cruelty on so many people. Even though my own faith was fairly dormant at the commencement of my imprisonment, it has certainly grown much stronger in the ensuing years. I know I will never be able to forget the horrors of that period of our lives, but thanks to a shared faith with my enemy and the supremacy of forgiveness in the midst of terrible injustices I have been able to forgive and to pray for my then enemies. For that is the only way to be at peace with all men, insofar as it depends upon me. I was attached to a party of about 30 which became known as the “Canteen Party”. When lunchtime came, we were given a tin of Bully Beef between four to supplement our rations. Also before returning to Camp he gave all of us, including the guards and drivers, a small bottle of German Stout, with the comment that “this will take care of your Vitamin B requirements”. (Masuta was very intelligent. He was highly educated and spoke five or six foreign languages fluently. He held a high ranking position in a large airline company.) As the days rolled by, Masuta was true to his word. Not only did he treat us in a civilized way, including his staff, but within a couple of months we had all regained our normal weight and, for some, a little extra. This building was badly damaged during the air raids and was in a mess, full of dust and rubbish. In order to save our clothes we’d take our shirts off and change into an older pair of shorts or wear just a G-string, to help beat the high humidity. We would then get changed again for our return to Camp. One day, to our great surprise, when a POW was working alone in a room stacking broken crates etc., a guard came in and made an obscene pass at him. The POW was so furious that, without thinking, he picked the guard up and threw him in to the heap of broken crates, then walked straight out to Masuta, who immediately took him into his office. Among other things, Masuta warned him never to do anything like that again, as the guard was within his rights to shoot him on the spot for attacking a guard. Masuta told the POW to go back to work and then called the guard in. After a long time, the guard came out and nothing more was heard of it. In the course of time, one of our fellows became ill and it was noticed by Masuta who said to me, “I have charge of that building next door and in the Penthouse upstairs there are beds, toilet etc. Bring the sick man and I will open the door for you to take him upstairs and then lock the door when you come out.” Before I came down I had a good look around and was amazed at the lavish standard of the place. It must have belonged to some rich importer or exporter who had to leave in a hurry. When the sick man told his story of what was upstairs many wanted to take a sickie and avail themselves of some absolute comfort - a proper bed and a real pillow. It was at least my moral responsibility to make sure anyone in the sick bay was ready for his bottle of stout and on parade. Yes, you have guessed it…I did forget to wake Frank Dwyer of Casino, NSW. Masuta by now had become confident that we could be trusted. When our officer said all were present, he believed it. We marched off and arrived at the Japanese Military Police HQ. As usual we were told to number and found we were one man short. Right then I remembered that I had forgotten Frank and passed the word to our officer, who told Masuta. Much was said in Japanese which we could not understand. We were all well aware of their torture methods of punishment and I seemed to be holding the short straw. However, after much talk which we didn’t understand, we were all marched back and found Frank peering anxiously out of a window. With Frank on board, we were marched back to the Military Police HQ then to the Great World. The next day, as usual, we went to Military Police HQ where Masuta and his usual staff took us to work. Masuta looked terrible and he gave me a long hard look, and just shook his head. I could only deduce from his looks that he was very disappointed in me, but he also realized that if I were blamed I may not survive the punishment. Masuta took it himself, knowing that at his rank, he would not be physically punished, albeit very verbal. About this time on arrival back at the Great World one evening, to our absolute horror, we saw the guards torturing a young Chinese boy, about 12 to 14 years old. The method used was shocking in the extreme, with legs tied together and hands tied behind his back, they put a pole between his legs and suspended him between two posts with his hair touching a Beef Ant’s nest. The boy was bleeding from his mouth, nose and his head, with ants swarming all over, in his mouth, nose and eyes, virtually eating his face away while he writhed in abject pain from every part of his body. The boy was gone the next morning. It is well known that Japan and China were at war, even before WW2 and the gulf between them was very obvious. It was not uncommon while marching to our place of work to see a Chinese head on top of a post. It is significant that Masuta had twin Chinese boys, Occa and Pinkie Pang Ho, to wash his eating utensils etc and somehow always had enough over for them to take home for their parents. I heard some time back that one of the fellows in the photo found Occa and Pinkie to be now both successful businessmen. The then boys are in the front row (white shirts), left of photo. Behind them with officer’s cap is Capt. Hugh Simmons and to the right of him is Masuta. I am on the extreme right, in the front row, with Red Cross arm band. All the POWs except me are from the 2/18th Battalion. In spite of Masuta’s trust in us, we did not always respond appropriately. Because many of us had friends in other working parties working from the same base camp, who weren’t doing nearly as well as us, I, along with many others, practiced the art of carrying a tin of, say, condensed milk size, in our crotch, wearing only a G-string, which was common attire when working inside, upstairs. So, with practice, we were able to achieve not only flat walking but, also, with a heavy case on our shoulders and a tin in our crotch, descend two flights of stairs, load the case onto a truck, then return via a patch of long grass and, without using our hands, would ‘lay the egg’ for retrieval later. This is where after witnessing the constant inhumanity and living hell of that period, I found it almost impossible to reconcile the word of the great Teacher, Jesus, who said to love your enemies and pray for those who persecute you. How on earth could I do that when everything within me screamed to do the opposite? Yet, ironically, it was the almost kind actions and words of Masuta that led me to see the wisdom in those words. If I was to be free from a lifetime of inner torment, then that was the key to releasing me. My enemy gave me the clue! What wisdom there is in those words, and “Forgive, that you might be forgiven”. Who was I to think that in the midst of this hell on earth that I was without ‘sin’, for none of us are innocent of wrongdoing when it comes down to it. Lt. Col. Peter Winstanley’s website on www.pows-of-japan.net under ‘articles’ – Medical Orderlies of Songkurai – Reg Jarman.